There is a link that connects Dito Yuwono’s works now and then: he collects memory. Some of these memories belong to himself while the rest belong to other people. He often starts small and takes a personal approach along the way. To him, memories are gateways to enter a past he yet to understand. When collected; these collective memories might form a bigger picture, story, and eventually find its way to history. Dito first started the project due to his curiosity when he meets the man who was seemed to be the last itinerant photographer standing in Kaliurang: Mr.Dasri. Mr.Dasri started to work as an itinerant photographer in the 80s during the heyday of Kaliurang as a well known resort area at the slope of Mount Merapi, 25 KM away from the center of Yogyakarta. Located 900m above the sea level, Kaliurang is famous with its cool mountains air and beautiful scenery. This area was first recognized in the early 19th century when the Dutch built several villas for their geologists’ family retreat. After independence, the ownership of these villas fell into the hand of the natives. Since that time; the royal family, companies, and individuals begin to build their vacation home at the area. I have been following Dito Yuwono for more than a year while he was doing his project, “Recollecting Memories: Tukang Foto Keliling (Itinerant Photographer)”. I was tailing him while he was playing detective for some reasons. First, I enjoy a good story and I saw him working on one at that time. Second, I can not resist a walking tour up and down the hill with fresh mountain air to have a long conversation with old men with genuine passion of what seem to be a raw approach to photography. Third, Kaliurang was also the place where I grew up. I was there when the tourist industry blossomed and later experience a free fall every four to six years when the volcano erupted. The industry has fallen and get back up again along with the cycle of Mt.Merapi, one of the most active volcanos in the world.. Changes were inevitable. I remember whenever we went for a picnic in the park, there were several itinerant photographers wearing blue Polaroid shirt offering to get our photo taken. Circa 2001, the number decreased significantly. When the Polaroid instant photo was still popularly used in the tourist area, there were approximately 13 photographers who were actively working in the whole recreational area in Kaliurang. Now, there are only two people left. One of them is working in Tlogo Nirmolo (the Japanese Cave), and the other is working in the area of Kali Adem (the eastern slope of Mount Merapi). Even though both of them are now using digital camera and portable photo printers that allows them to print the photo directly on the spot, one of them still wears the blue Polaroid shirt with pride. When Dito moved to Kaliurang, it was like taking an artist around at the beginning of his residency. He starts paying attentions to things I, as a local, easily overlook. That was when he saw this guy wearing a blue Polaroid shirt with a big backpack to carry his photography tools. Even with all the changes that happens in Kaliurang tourist industry, Mr.Dasri was still devotedly get up in the morning, climb the hill, wait in front of one of the cave that was built by the Japanese in the 40s, and wish for a tourist to come and get their picture taken. What was started out as a business later becomes his passion. The brief solitary walk in the hope of making one or two photograph a day has become more of a ritual. Dito then started to follow him around, digging into his old achieve, and recollect the shattered memories. They soon become friend and carefully weave these threads of memories into one big story in a year. In the process, he came across another photographer who is still actively working and successfully made a humble management system for his business; those who ditched photography once the business was dropped; and several others who do not stay in the job but still keeping the achieve as a memorabilia of the good old days. Dito starts to see each of their work and find personal aspect of this project. On the other side, there are bigger picture to see. He started to sees the connection between memory, citizen, history; and how collective memory of these citizens can be in line with bigger thing that was happening at that era. First, the New Order’s tourism campaign; second, the Polaroid industry; and third, the rise of digital technology. During the New Order era, tourist photography is nurtured and presented as Indonesian government increasingly devoted its economic strategy to develop tourism industry. A national campaign of “Tourism Awareness” (Kampanye Sadar Wisata) was brought to promote appropriate attitude to facilitate tourism and general public awareness of the value of tourism. Photography was supported by the state, particularly to help promoting tourism. The rise of itinerant photographer in Kaliurang was first started in 1981 with the presence of official Polaroid’s distributor. A local citizen was designated as an official representative of the distributor and create a system that allow these itinerant photographer to formally stationed in every tourist destination in the area. Post-eruption of Mount Merapi in 1994, the amount of tourist visits to Kaliurang started to drop; followed by the declining consumption of tourist portraits. A strategic marketing turn has to be made and they start selling various photographs of Mount Merapi eruption as a tourist souvenir. In the beginning of 2000, the Polaroid instant camera products’ sales began to decline. It led to the change of distribution pattern for instant film photography groups in Indonesia tourism area. By 2005, the official representative of Polaroid distributor in Kaliurang was laid off and in 2008; Polaroid announced to public that their instant film production is ended. At that time, the number of these itinerant photographers dropped dramatically, leaving only two of thirteen men in the business. Other than that, the technological shift from analog to digital allows everyone to bring their own camera. Photography that was always meant to be an open field for everyone is proven to be less and less exclusive by the development of technology. Suddenly, everyone can play a role as photographer themselves. Respectively, the presence of itinerant photographers is no longer considered relevant and slowly started to erode. His first attempt to seek for a narrative of these itinerant photographers was done by creating an exhibition for them. In search of physical artifacts and relics on the Kaliurang Photography Group’s heyday, Dito found a grey area that is somehow similar to their memories: a bit faded and mixed. It can be seen by how the photo materials are brittle, the humidity caused loss or damaged photographed, there was no catalogue system, and there was no awareness to properly store the photo to ensure its durability. At the end of the year, Dito got the whole story about the informal group of itinerant photographer in Kaliurang. He uses the term "Kaliurang Photography Group" to refer to those who became itinerant photographer in the Kaliurang between 1981-2005. Their engagement in this 'group' is limited to the form of the distribution pattern of Polaroid products with no attachment. The connection that unites them was unofficial, voluntary, and organic. At that time, instead of taking position as an artist; Dito decided to curate and put up a group show of these photographers’ achieve collections and personal photographic work. He then exhibits it in what seem to be a familiar and non-exclusive environment for them: a hotel room. The exhibition was like a reunion and a tribute to these photographers; a wrap up to the year-long journey that put the pieces of the puzzle together. Few months after the group exhibition of what Dito refers as “Pameran Kelompok Fotografi Kaliurang” (Kaliurang Photography Group Exhibition); he continued the project focusing on the present day aspect of tourist photography. What was once a dream to see the world through other people’s eyes has come true through Instagram. The mundane things other people experience during their travelling time are now just one fingertip away. When he was working on the first part of the project, Dito starts to question the essence of tourist photograph taken by the itinerant photographers. Those Polaroid photos are taken home as a keepsake of the memory, a souvenir for the beloved one, or to be displayed on the living room. These days, the function of a photograph as a keepsake of the memory remains. The necessity to keep it as a souvenir from the merrier day has shifted from prints to digital form. Those photographs people used to display in the privacy of their living room, is now shared for the whole wide world to see. Dito later chooses instagram as the focus field for his observation for its quality of instant sharing, accessibility, and its ability to answer the need as a digital souvenir of the memory that can be shared to every audience. Based on his observation, the practice of tourism photography almost always involves three elements all at once; the tourist, the photographer, and the landscape. All of which can now merged into one. The practice of selfie as a tourist portrait has changed the position and the presence of a photographer; replacing them by a tripod, monopod, or even the tourist’s own hand. While the landscape photographs are continuously reproduced in similar visual aesthetic, it needs to be differentiated using the ‘hastag’. Hashtag was first popularized in the 2007 via Twitter. Hashtag then functioned as folder separator to facilitate engine search, and affect the appearance of a trending topics (hot topics that are widely discussed in Twitter). This approach is later used and developed to categorize various other social medias including Instagram. Aside from that, the way people use hastag underwent a shift in where people start using more than one hashtag in a single upload. It contrasting to the early days of its development when hashtag generally only written three times in a single upload. The function in most Instagram hash tags nowadays is still surrounded by the conversation of categorization efforts; but its use tends to be descriptive and not only explain what is in the photo, but also includes things that are not visible in the photograph. For Dito, the use of a very descriptive hashtag is not only serves as additional information but also serve as photography itself (unphotographed photography). Each hashtag summon the memory of experiences to suit every word that appears as a keyword. The perspective provoked by the photo displayed can be influenced by the hastag; especially for selfies in which people’s face might be covering a significant part of the frame. Hashtag evolves from a foldering tool into a descriptive illustration of the things that do not appear in the photo. The public are encouraged to imagine these things that is directly tied to memory and personal experience just by using several keywords. This second part of the project was briefly presented at Lir Space – Yogyakarta while the ‘exhibition’ are put up online in the instagram account @wisataselfie (http://instagr.am/wisataselfie) and @wisatatagar (http://instagr.am/wisatatagar). By the time Dito met two itinerant photographers who are still actively working on the slope of Mt.Merapi, he starts to wonder if there are still any other itinerant photographers working at other tourism site in Indonesia. This time, he went to the National Monument (abbreviated Monas) that was build during Soekarno era as a symbol of pride and struggle for independence. As a national landmark that is located in the capital city, Monas still attract many visitors. Taking photograph at Monas was once upon a time a national symbol of self-representation and belonging to the nation. Yet, instead of looking back to the nostalgic aspect of the itinerant photographers in Monas, Dito chooses to see the present and the future. Unlike what happened to its industry in Kaliurang, the itinerant photography business is still very much present at Monas. A number of itinerant photographers are still working around the park and despite the political turn and new management issue that might cost them their field; the group of itinerant photographer are currently fighting for their welfare. 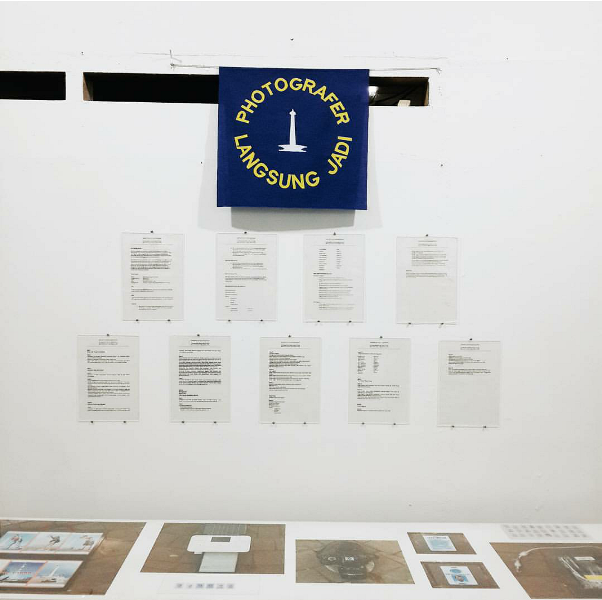 For his project, Dito is creating an imaginary cooperation in a corner of the gallery of Ruang Rupa to see how the practice of tourism itinerant photography is sustained through its socio-economic aspect. This project can be considered as a rebranding attempt for itinerant photographer in the hype of the analog in the digital age using visual language that is easily understood. At the same time, he also create a study of pose as a trademark. No matter how strange it might sound— pose can be some kind of business intellectual property for few minutes before people will start to adapt and copy it. After all, in a popular place like Monas, there can not be many original ideas left while avoiding the tourist cliché. The third part of Recollecting Memories of Tukang Foto Keliling might not be the last of the series. The artist will still be following the path of the itinerant photographer, putting the puzzle pieces together; trying to see the big picture while adding up personal details in it. Terdapat sebuah ikatan yang menghubungkan karya-karya Dito Yuwono dari waktu ke waktu: ia mengumpulkan kenangan. Beberapa di antara kenangan tersebut adalah miliknya sementara sisanya adalah kenangan yang dimiliki orang lain. Ia kerap memulai dari hal-hal kecil dan menggunakan pendekatan personal sepanjang perjalanan. Baginya, kenangan adalah pintu gerbang memasuki masa lalu yang belum dipahaminya. Ketika dikumpulkan, kenangan kolektif ini mungkin akan membentuk gambaran yang lebih besar, kisah-kisah, dan pada akhirnya akan menemukan jalannya menuju sejarah. Dito pertama kali memulai proyeknya atas dasar rasa penasaran saat bertemu seorang pria yang saat itu terlihat seperti fotografer keliling terakhir yang masih bekerja di Kaliurang: Pak Dasri. Pak Dasri mulai bekerja sebagai seorang fotografer keliling pada tahun 80an pada masa kejayan Kaliurang sebagai salah satu area peristirahatan terkemuka di lereng gunung Merapi, 25km dari pusat kota Yogyakarta. Terletak 900m di atas permukaan laut, Kaliurang terkenal dengan udaranya yang sejuk dan pemandangannya yang indah. Area ini pertama kali dikenal pada awal abad ke-19 ketika Belanda membangun beberapa villa peristirahatan untuk keluarga para geologis. Setelah masa kemerdekaan, kepemilikan vila-vila ini jatuh ke tangan warga lokal. Sejak saat itu; keluarga kerajaan, perusahaan-perusahaan, dan orang-orang mulai membangun rumah liburan mereka di area ini. Saya telah mengikuti Dito Yuwono selama lebih dari satu tahun saat ia membuat proyeknya, "Recollecting Memories: Tukang Foto Keliling". Saya membuntutinya saat ia bermain-main bak seorang detektif karena beberapa alasan: pertama, saya adalah penikmat cerita yang bagus dan saya melihatnya sedang mengerjakan sebuah cerita yang bagus. Dua, saya tidak bisa menolak ajakan berjalan kaki naik turun bukit untuk berbincang dengan lelaki tua yang memiliki minat kuat pada fotografi yang begitu polos. Ke-tiga, Kaliurang juga merupakan tempat saya tumbuh dewasa. Saya berada di sana saat industri pariwisata berkembang dan kemudian mengalami jatuh bebas setiap empat sampai enam tahun sekali ketika gunung Merapi erupsi. Industri ini telah jatuh bangun seiring dengan siklus erupsi gunung Merapi yang merupakan salah satu gunung paling aktif di dunia. Perubahan tidak dapat dihindari. Saya teringat saat kami dulu pergi piknik di taman, terdapat beberapa fotografer keliling dengan kemeja Polaroid biru yang menawarkan jasa mereka untuk memotret kami. Sekitar tahun 2001, jumlah mereka menurun drastis. Saat foto instan Polaroid masih populer digunakan di area wisata, terdapat sekitar 13 fotografer yang secara aktif bekerja di seluruh area wisata di Kaliurang. Saat ini hanya dua orang yang tersisa. Salah satu dari mereka bekerja di area Goa Jepang di Tlogo Nirmolo sementara satunya bekerja di Kali Adem (sisi timur dari lereng Merapi). Meskipun keduanya kini menggunakan kamera digital dan printer foto portable yang memungkinkan mereka mencetak foto secara langsung di lokasi, salah satu dari mereka masih mengenakan kemeja biru Polaroid dengan penuh kebanggaan. Ketika Dito pindah ke Kaliurang, rasanya seperti sedang membawa seorang seniman residensi berkeliling di awal masa residensinya. Ia mulai memperhatikan hal-hal yang mudah terlewatkan oleh saya yang merupakan penduduk setempat. Saat itu lah Dito melihat lelaki yang mengenakan kemeja Polaroid biru dengan tas punggung besar untuk membawa keperluan fotonya. Meskipun didera perubahan di dalam industri pariwisata di Kaliurang, Pak Dasri masih dengan setia bangun di pagi hari, mendaki bukit, menanti di depan salah satu goa yang dibangun oleh tentara Jepang pada tahun 40an, dan berharap ada wisatawan yang datang meminta dipotret. Hal yang awalnya merupakan bisnis semata kemudian berkembang menjadi passion-nya. Perjalanan singkat dalam kesendirian dengan harapan membuat satu dua foto per hari telah menjadi semacam ritual baginya. Dito pun mulai mengikutinya, menggali arsip-arsip lama, dan mengumpulkan kenangan-kenangan yang berceceran. Mereka pun berteman dan secara hari-hati memintal benang-benang ingatan ini menjadi sebuah cerita besar selama satu tahun. Dalam prosesnya, ia bertemu seorang fotografer lain yang masih secara aktif bekerja dan sukses membuat sistem manajemen sederhana untuk bisnisnya; bertemu dengan mereka yang meninggalkan dunia fotografi segera setelah bisnisnya menurun; dan beberapa lainnya yang tidak lagi menjalankan pekerjaan tersebut namun menjaga arsip kenang-kenangan atas hari-hari indah di masa lalu. Dito pun mulai melihat karya mereka satu per satu dan menemukan aspek personal dalam proyek ini. Di sisi lain, terdapat gambaran lebih besar untuk dilihat. Ia pun mulai menemukan hubungan antara kenangan, warga, dan sejarah; serta bagaimana ingatan kolektif para warga ini bisa sejalur dengan hal besar yang terjadi pada era tersebut. Pertama, kaitannya dengan kampanye wisata yang dilakukan pemerintah saat Orde Baru; ke dua, industri Polaroid; dan ke tiga, munculnya teknologi digital. Sejak masa Orde Baru, fotografi wisata dikembangkan dan ditampilkan sejalan dengan pemerintah Indonesia yang semakin mendedikasikan strategi ekonominya untuk mengembangkan sektor industri wisata. Sebuah Kampanye Sadar Wisata yang bertaraf nasional dibawa untuk mempromosikan sikap-sikap yang dirasa benar dalam memfasilitasi industri pariwisata dan mengembangkan kesadaran masyarakat umum atas nilai pariwisata. Fotografi saat itu mendapatkan dukungan dari negara, terutama untuk membantu mempromosikan pariwisata. Kemunculan para fotografer keliling di Kaliurang dimulai pada tahun 1981 dengan adanya distributor resmi Polaroid. Seorang warga lokal ditunjuk sebagai perwakilan resmi distributor tersebut dan menciptakan sistem yang membuat para fotografer ini ditempatkan secara resmi di setiap tempat wisata di area tersebut. Setelah erupsi Merapi tahun 1994, jumlah kunjungan wisatawan di Kaliurang mulai menurun; diikuti dengan menurunnya konsumsi potret wisatawan. Sebuah perubahan strategi pemasaran harus dilakukan untuk menyikapinya dan mereka mulai menjual berbagai jenis foto erupsi gunung Merapi sebagai kenang-kenangan bagi para wisatawan. Di awal tahun 2000, penjualan produk kamera instan Polaroid mulai menurun. Hal tersebut membawa perubahan pola distribusi untuk kelompok-kelompok fotografi kamera instan di seluruh area wisata di Indonesia. Pada tahun 2005, sang perwakilan resmi bagi distibutor Polaroid di Kaliurang diberhentikan dan pada tahun 2008; Polaroid mengumumkan pada publik bahwa produksi film instan mereka dihentikan. Pada saat itu, jumlah fotografer keliling menurun secara dramatis dan menyisakan hanya dua dari tigabelas fotografer dalam bisnis tersebut. Selain itu, pergeseran teknologi dari yang analog ke digital menjadikan semua orang bisa membawa kamera mereka masing-masing. Fotografi yang selalu dimaksudkan untuk menjadi lahan terbuka bagi setiap orang terbukti semakin tidak eksklusif dengan adanya perkembangan teknologi. Tiba-tiba, setiap orang bisa memainkan peran sebagai seorang fotografer. Karenanya, kehadiran para fotografer keliling dinilai tidak lagi relevan dan perlahan-lahan mulai terkikis. Usaha awal Dito dalam mencari narasi bagi para fotografer keliling ini dilakukan dengan membuatkan pameran bagi mereka. Dalam pencarian artefak fisik dan peninggalan dari masa kejayaan Kelompok Fotografi Kaliurang, Dito menemukan area abu-abu yang entah bagaimana terasa mirip dengan kenangan-kenangan mereka: sedikit buram dan campur aduk. Hal ini terwujud dalam materi foto yang rapuh, kelembaban yang menyebabkan foto hilang atau rusak, tidak adanya sistem katalog, dan tidak adanya kesadaran untuk menyimpan foto dengan benar untuk menjaga keawetannya. Di akhir tahun, Dito mendapatkan cerita utuh dari kelompok tidak resmi para fotografer keliling Kaliurang ini. Ia kemudian menggunakan istilah "Kelompok Fotografi Kaliurang" untuk menyebut mereka yang menjadi fotografer keliling di Kaliurang di tahun 1981 - 2005. Hubungan para fotografer dalam 'kelompok' ini terbatas pada bentuk pola distribusi produk Polaroid tanpa adanya ikatan yang pasti. Hubungan yang menyatukan mereka lebih berupa hubungan yang tidak resmi, sukarela, dan organik. Saat itu, alih-alih mengambil posisi sebagai seorang seniman; Dito memutuskan untuk melakukan kurasi dan menampilkan sebuah pameran kelompok dari arsip-arsip koleksi para fotografer ini dan karya personal mereka. Dito kemudian menampilkannya dalam sebuah pameran di tempat yang akrab dan lingkungan yang dirasa tidak eksklusif bagi mereka: sebuah kamar hotel. Pameran ini kemudian lebih mirip sebuah reuni dan tribut untuk para fotografer ini; sebuah penyelesaian utuh atas perjalanan setahun dalam menyatukan setiap bagian dari teka-tekinya. Beberapa bulan setelah pameran kelompok yang disebut Dito sebagai "Pameran Kelompok Fotografi Kaliurang'; ia melanjutkan proyeknya dengan fokus pada aspek terkini dari fotografi wisata. Apa yang dulunya merupakan impian untuk melihat dunia melalui mata orang lain kini telah terwujud melalui Instagram. Hal-hal kecil sehari-hari yang dialami oleh orang lain saat mereka berlibur kini bisa dilihat dalam satu sentuhan jari saja. Ketika ia mengerjakan bagian pertama dalam proyek ini, Dito mulai mempertanyakan esensi potret para wisatawan yang diambil oleh fotografer keliling. Foto-foto Polaroid tersebut umumnya dibawa pulang untuk menyimpan ingatan, sebagai oleh-oleh bagi yang orang tercinta, atau untuk dipajang di ruang tengah. Saat itu, fungsi foto sebagai alat menyimpan kenangan masih berlaku. Kebutuhan untuk menyimpannya sebagai cinderamata dari hari-hari yang lebih ceria kini bergeser dari versi cetak ke versi digital. Foto-foto yang dipajang orang-orang dalam ruang tengah yang privat, kini dibagi untuk dilihat oleh seluruh dunia. Dito kemudian memilih instagram sebagai area inti observasinya atas dasar kualitasnya yang mampu dibagikan secara instan, kemudahannya untuk digunakan, dan kemampuannya untuk menjawab kebutuhan cinderamata digital atas kenangan-kenangan yang kini bisa diperlihatkan ke semua penonton. Berdasarkan observasinya, praktek fotografi pariwisata hampir selalu mengandung tiga elemen sekaligus; wisatawan, fotografer, dan latar belakang. Semua itu kini telah tergabung menjadi satu dalam praktek selfie. Praktek selfie sebagai foto diri wisatawan kini mengubah posisi dan kehadiran fotografer; menggantinya dengan adanya tripod, monopod, dan bahkan tangan sang wisatawan itu sendiri. Sementara itu foto-foto lanskap mulai direproduksi dalam estetika visual yang mirip-mirip, sehingga terdapar kebutuhan untuk menambahkan pembeda berupa tagar. Tagar awalnya dipopulerkan di tahun 2007 dalam Twitter. Tagar kemudian berfungsi sebagai pemisah folder untuk memfasilitasi alat pencarian dan mengubah penampilan sebuah trending topic (topik yang sedang hangat dibicarakan dalam Twitter). Pendekatan ini kemudian digunakan dan dikembangkan untuk melakukan kategorisasi dalam berbagai media sosial lain termasuk Instagram. Selain itu, bagaimana orang menggunakan tagar pun mulai berubah dengan cara penggunaan banyak tagar sekaligus dalam satu unggahan. Hal itu berlawanan dengan awal mula perkembangannya yang biasanya hanya tertulis satu hingga tiga tagar dalam satu kali unggahan. Fungsi tagar dalam kebanyakan foto instagram kini pun masih berkisar antara percakapan tentang usaha mengkategorisasikan; namun kegunaannya kini cenderung deskriptif dan tidak hanya menjelaskan apa yang ada di dalam foto, namun juga hal-hal yang tidak terlihat dalam foto tersebut. Bagi Dito, penggunaan tagar yang begitu deskriptif kini tidak hanya berfungsi sebagai informasi tambahan namun juga menjadi bentuk fotografi itu sendiri (fotografi yang tidak terpotret). Setiap tagar memanggil kenangan atas pengalaman yang cocok dengan setiap kata yang muncul sebagai kata kunci. Perspektif yang muncul ketika melihat foto bisa dipengaruhi oleh tagar; terutama dalam foto selfie ketika wajah orang dalam foto bisa saja menutupi sebagian besar bagian di dalam bingkai foto. Tagar kemudian berkembang dari alat untuk mengelompokkan foto menjadi ilustrasi deskriptif atas hal-hal yang tidak terlihat dalam foto. Publik yang melihat foto tersebut kemudian disarankan untuk membayangkan hal-hal yang tidak terlihat tersebut dalam hubungannya dengan ingatan dan pengalaman personal masing-masing hanya melalui beberapa kata kunci. Bagian ke-dua dari proyek ini secara singkat dipresentasikan di Lir Space - Yogyakarta sementara 'pamerannya' dilakukan daring melalui akun instagram @wisataselfie (http://instagr.am/wisataselfie) dan @wisatatagar (http://instagr.am/wisatatagar). Ketika Dito bertemu dua fotografer keliling yang masih bekerja secara aktif di lereng gunung Merapi tersebut, ia mulai bertanya-tanya apakah masih ada fotografer keliling yang bekerja di situs wisata lain di Indonesia. Maka kali ini, ia pergi ke Monumen Nasional (Monas) yang dulu dibangun pada masa Soekarno sebagai simbol kebanggaan dan perjuangan kemerdekaan. Sebagai salah satu landmark nasional yang terletak di ibukota, Monas masih menarik perhatian banyak pengunjung. Berfoto di depan Monas pada suatu ketika pernah menjadi simbol nasional atas representasi diri dan perasaan memiliki atas negara ini. Namun alih-alih melihat kembali aspek-aspek nostalgia atas para fotografer keliling di Monas, Dito memilih untuk melihat masa kini dan masa depan. Berbeda dengan yang terjadi pada industri di Kaliurang, bisnis foto keliling masih beroperasi di Monas. Sejumlah fotografer keliling masih beroperasi di sekitar taman dan meskipun terdapat perubahan politik dan isu manajemen yang mungkin akan menghilangkan lahan mereka; kelompok fotografer keliling ini sekarang sedang memperjuangkan kesejahteraannya. Untuk proyeknya ini, Dito menciptakan sebuah koperasi imajinatif dalam salah satu sudut galeri Ruang Rupa untuk melihat bagaimana praktek fotografi wisata ini berkelanjutan melalui aspek sosio-ekonominya. Proyek ini bisa juga dilihat sebagai sebuah usaha melakukan pembaruan atas citra para fotografer keliling di tengah maraknya hal-hal yang analog di era digital ini, dengan menggunakan bahasa visual yang mudah dimengerti. Pada saat bersamaan, Dito juga mempelajari pose sebagai bentuk kekhasan. Meskipun awalnya mungkin terdengar aneh-- namun pose bisa menjadi semacam hak milik intelektual dalam bisnis selama beberapa menit sebelum orang-orang mulai melakukan adaptasi dan menirunya. Bagaimanapun juga, di tempat populer seperti Monas, kemungkinan tidak ada lagi cukup banyak ide original untuk menghindari foto-foto cliché yang sering dibuat para wisatawan. Bagian ke-tiga Recollecting Memories: Tukang Foto Keliling ini mungkin tidak akan menjadi seri terakhir bagi proyek ini. Sang seniman masih akan mengikuti jejak para fotografer keliling, menyusun potongan-potongan gambar dalam teka-tekinya; mencoba untuk melihat gambaran besarnya sembari menambahkan detil-detil personal di dalamnya.